My kids get so much candy for Valentine’s Day. It often looks like a repeat of trick-or-treating. Here is a fun activity to do with your kids. All ages can enjoy it, even those pesky to please preteens. It is a unique way to thank a teacher or just make a friend smile. 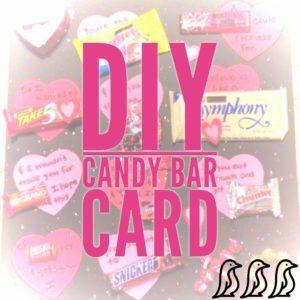 Plus added bonus – USE SOME OF THAT EXTRA VALENTINE’S CANDY!!! Decide who the lucky person is to receive your awesome card. Then plan out what you want to say. Make sure you are keeping in mind your Valentine candy inventory! Print your message on regular computer paper or have your kiddo hand write it for a personal touch. Then use double-sided tape to attach it to colored cardstock or directly to the poster board. Make sure to leave spaces for your candy! 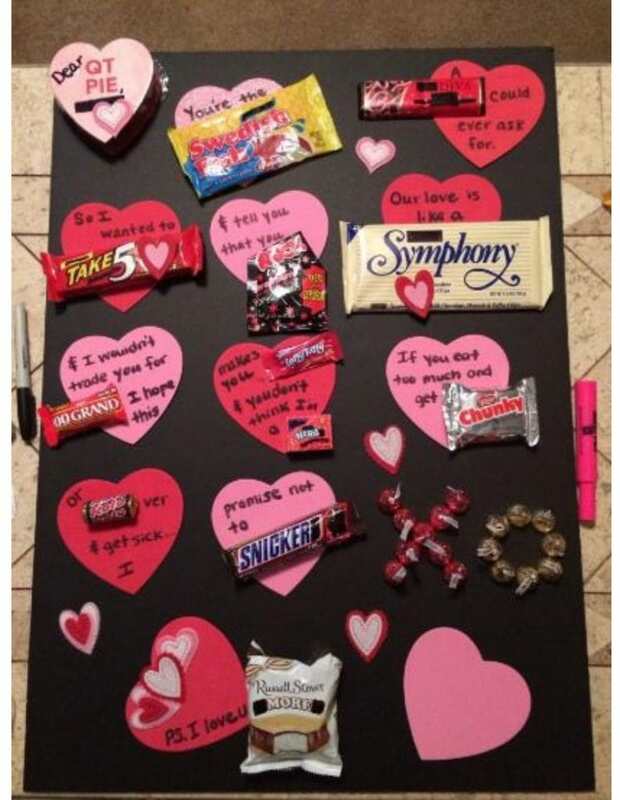 Attach the candy to the poster board. Depending on the candy, you may have to use something stronger than double-sided tape. Shipping tape works great. VIOLA! You have a unique gift for that someone special. Plus you got to spend some quality craft time with your kiddos… AND DON’T FORGET TO LET THE RECIPIENT KNOW THE CANDY IS SUPER YUMMY AND FRESH! 3 Musketeers – We are like the 3 MUSKETEERS, I don’t need the 3 MUSKETEERS with you around. 5th Avenue – You are worth more to me than all the stores on 5th AVENUE. After Eight – Meet me AFTER EIGHT. Air Heads – Sometimes they say I am such an AIR HEADS. Almond Joy – You bring me such ALMOND JOY (you can cover up the Almond part). You are the ALMOND JOY of my life. Baby Ruth – BABY RUTH can’t hit home runs like you can! Bar None – You are BAR NONE the best ________ (fill in the blank). Big Hunk – To My BIG HUNK. You are such a BIG HUNK. Bit ‘O Honey – I’ll always be your BIT ‘O HONEY. You’ll always be my BIT ‘O HONEY. Boost – You give me a real BOOST. Butterfinger – the money slipped through my BUTTERFINGER. I’m glad I didn’t let you slip through my BUTTERFINGER. Crunch – You always help me when I am in a CRUNCH. Dum Dum – I know you are not a DUM DUM. I’m now DUM DUM cuz I know how much I love you. Extra (gum) – You make me feel EXTRA special. Good & Plenty – And that’s GOOD & PLENTY for me. Hershey’s Air Delight – You fill me with DELIGHT (cover up the AIR). Hershey’s Nuggets – All the NUGGETS of Gold wouldn’t make me stop loving you. Hot Tamales – You are one HOT TAMALES. Hubba Bubba – To My HUBBA BUBBA. Hugs & Kisses – HUGS & KISSES. Junior Mints – We are MINT to be together. Laffy Taffy – You Always Make Me LAFFY TAFFY. Lifesaver – You’re a real LIFESAVER. Marathon – I would run a MARATHON to prove my love for you. Milk Duds – Our love is not a DUD. Milky Way – Sends me to the MILKY WAY. You are the brighest star in the MILKY WAY. I’ll take you on a trip to the MILKY WAY. Mounds – I love you MOUNDS, Let’s have MOUNDS of fun today. We’ll have MOUNDS of fun. Mr. Goodbar – To my MR. GOODBAR. Nerds – If I wasn’t such a NERDS. Nestle’s Chunky Bar – If you eat all the candy on this card you might get CHUNKY, but I won’t care! Nestle’s Goobers – Don’t think I’m a GOOBERS. Now & Later – I love you NOW & LATER. Oh Yeah – I Thought OH YEAH. Pop Rocks – You totally ROCK! Reese’s Peanut Butter Cups – There are a million REESES why I love you. Here are the REESES that I love you. Reese’s Pieces – Our love has never gone to PIECES. I love you to PIECES. Rolo – With you in my life, I can ‘rolo’ with the punches. May you always ‘rolo’ with the punches. Shockers – When we first met it was such a SHOCKERS. Skor – Tonight you are going to SKOR. Snickers – If my check, doesn’t make me SNICKERS. You never SNICKERS at my concerns. Starburst – You are a STAR in my eyes. Sugar Daddy – Handsome SUGAR DADDY. Hello SUGAR DADDY. Sweethearts – Love your SWEETHEARTS. Thanks for being such a SWEETHEARTS. Symphony – Our love is like a SYMPHONY. Take 5 – I TAKE 5 minutes each day to count my blessings. I wanted to TAKE 5 and let you know how much I love you. Twix – TWIX you and me you are the best. Twizzlers – May your TWIZZLERS never fizzle! U-No Bar – Do UNO how proud I am of you? Do UNO how much I love you? Whatchamacallit – I decided to get you a WHATCHAMACALLIT, I was going to get you a WHATCHAMACALLIT. Nicole is a dental hygienist with over 17 years in the field. She is passionate about children’s dental health, and educating the public as to how it is linked to overall health. 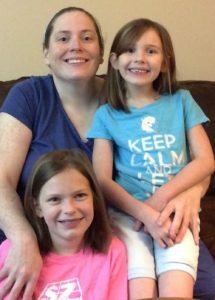 And it just so happens that her husband, Ken Kilgore, also shares an interest on keeping kids healthy and safe — he makes customized children’s beds to help a child transition from crib to big kids bed in a fun way.